You might recognize firecracker JoJo Siwa from Abby's Ultimate Dance Competition, or maybe you fell in love with her on Dance Moms. 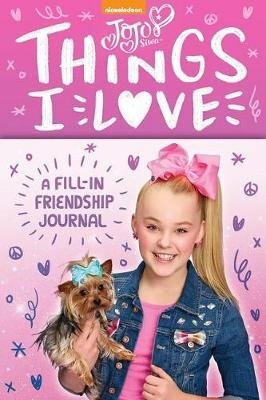 Now, just in time for Valentine's Day, JoJo presents us with Things I Love, a creative journal with writing activities based on JoJo's favorite things: dogs, candy, glitter, sparkles, the color pink, dance, family, and the Siwanatorz--her ardent posse of fans. Published in 2-color and filled with fun prompts and quizzes, Things I Love is sure to appeal to kids of all ages.